The Seahawks only managed one touchdown scoring drive on Sunday against the Cardinals. Luckily, thanks to some help from the defense and some missed field goals by Arizona, Seattle was able to pull off the win in their home opener. Coach Pete Carroll says the team is going to need more production than that on offense if the team is going to win this week. A statement all of us can agree with. I know there are probably a lot of Seahawks fans who remember what happened when Atlanta came into town last year, and in response are writing off this game as a loss already. But these are different teams and it’s a different season. While some may argue that Seattle does seem to be much improved from last year, Atlanta isn’t exactly playing like they did a year ago either. In fact the Falcons haven’t scored more than 13 points in a road game all year, which has left them winless away from their own home crowd. Let’s hope that it stays that way. The road trip to Seattle is the longest one they will take this year. Other reasons for optimism are how well the defense appears to be playing this year and Tarvaris Jackson seems to be very reluctant to throw interceptions—something that plagued the Hawks against last year’s Falcons. The team was only a touchdown behind coming out of halftime last year when the team imploded. Matt Hasselbeck was intercepted twice leading to two Falcons touchdowns, and Matt was ultimately pulled in favor of Charlie Whitehurst. On top of getting more than one touchdown, he noted the importance of continuing to get pressure on the quarterback by the defensive line. While they were able to get good pressure on Kevin Kolb at times last week, there were many other where he was given far too much time to get comfortable in the pocket and step up to make a throw. Despite not having a receiver like Larry Fitzgerald, Matt Ryan has enough weapons to do plenty of damage when given time. I’ll be posting a few photos from last Sunday’s Seahawks game soon. I’ve already posted one on Facebook of the Military Sea Hawkers Honor Guard with Walter Jones. We happened to run into him in the tunnel after coming off the field during the pregame walkthrough. Check out the photo here: http://on.fb.me/n6zOwA. I want to drop a quick reminder to the Military Sea Hawkers who plan on attending the game to check out the Events tab on the website. You can look and see what other members are planning on attending the game and post comments there. I also look there first to see if there is anyone on the “may attend” list and contact those folks first if we have ticket donors. Thanks to the generosity of our fellow #12s, we’ve had four members of the club who have been able to attend a game for free against the Raiders, Cardinals, and this weekend against the Falcons. Also, congratulations to Military Sea Hawker Bart Holder who won tickets to the Arizona Cardinals game via a Twitter contest held by Seahawks left tackle Russell Okung. 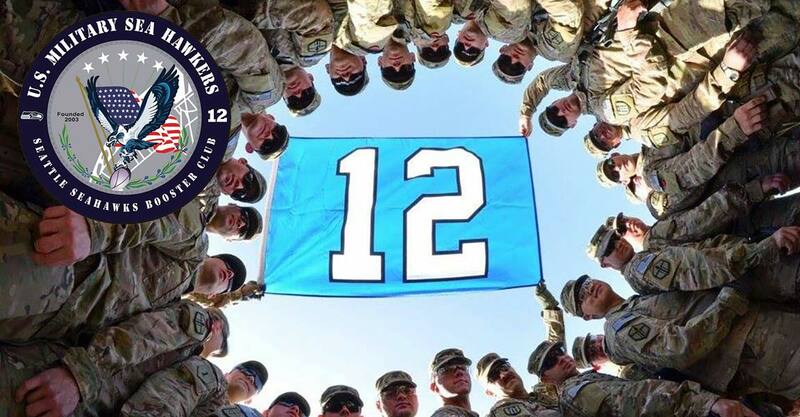 Those of you serving overseas are going to have to wait at least another week to watch our Seahawks play on television. Nothing is scheduled on Direct-to-Sailor or on American Forces Network. Have a great weekend! Looking forward to a big win and seeing the team back at .500! GO HAWKS!